Mike Reid Mixes it up at The Whiskey Bar! Featured here is the $6 Manhattan – Old Forester Signature/Dolin Rouge/Angostura bitters. The latest fad in the world of mixology and the consumption of adult beverages – The Whiskey Bar – has come to Old Town Alexandria. Secluded in a specific area of the restaurant, the whole idea is to set a different tone and to offer over a hundred whiskeys and bourbons as well as some unique selections of scotch, vodka, gin, tequila and rum. Union Street Public House has recently opened the Whiskey Bar 1986 1986 was the year USPH opened. Those of you who are familiar with Union Street will be familiar with the space. The former Oyster Bar has been transformed into a room with dark woods and a copper topped bar that seats about a dozen customers. 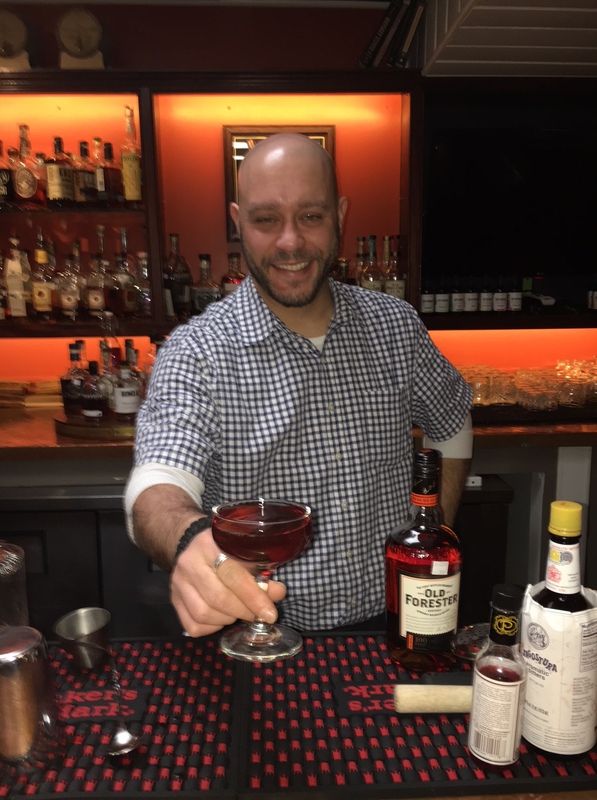 The Whiskey Bar is open Wednesday through Saturday nights from 5 p.m. until closing and the resident bartender is Mike Reid. Reid conjures up all of the house inspired cocktails ranging from I Cannot Tell a Lie…Knob Creek/Cherry Brandy/Apple randy/Cream Sherry to On Island Time Flor De Cana 7 year/Carmaro/Crème de Cacao/Lemon Juice. The 1986 Whiskey Bar offers over 130 brands of Bourbons and Whiskeys, 32 Scotches and numerous Gins, Vodkas, Tequilas and Rums. The prices are very reasonable and you can also order from the restaurant menu if you are hungry. While this column normally highlights a bartender and his/her likes dislikes and commentary, we thought it might be fun to change it up a bit to give the Whiskey Bar concept some exposure. As always, if you would like to see your favorite mixologist featured in this space, send contact information to office@oldtowncrier.com.